Here's a look at some of our clients, celebrating their awesome experiences through written testimonials that we've gratefully received over the years. Definitely! I feel happier and luckier after purchasing this flat. Life has changed for better. Owning a glat in Santha Towers is a symbol of security for my retired life. ~ Jalaja Madanmohan,B103 - Omshakthy Santha Towers. I specifically would like to thank Omshakthy and its team for providing, at extra vost, Reticulated Gas facility which was not originally listed in the construction agreement. ~ D. Dhanasekaran,D802 - Omshakthy Santha Towers. We are proud to be the owners of Santha Towers which has fulfilled all our criteria's, Our sepcial thanks to the management who have conceptualised budget homes. ~ C. Nireesh,B703 - Omshakthy Santha Towers. Its simply Awesome, wondeerful living environment and its remarkable tribute to both Omshakthy & Santha Towers to change the vicinity of Paruthipattu as spree in Chennai forever. ~ Inturi Sivanarayana, B802 - Omshakthy Santha Towers. Omshakthy built the flats in an uncompromised quality. I have observed it in stage wise. 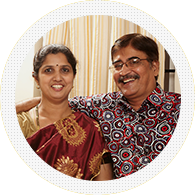 Omshakthy stands first to find the strategic location like Paruthipattu to community living. Customer Friendly in sorting out the needs of customer. ~ Aradyula V Sastry, B801 - Omshakthy Santha Towers. It is really our weekend gateway for the time being. So at present my views are filled with peace, tranquillity, energy, breeze and brightness. ~ S. Vasant Rao, C1004 - Omshakthy Santha Towers. if you're eligible for a position. how you should be investing in this field. Confused about buying a new house? Omshakthy Agencies (Madras) Private Ltd.